My friends and family know that I am a huge fan of matcha! Matcha is a powdered green tea from Japan that delivers health benefits. Matcha is high in antioxidants, it detoxifies the body, boasts concentration, increases energy levels, relaxes the mind and helps in weight loss. Matcha icecream has always been my favourite, I am always craving for them! Whenever I am an ice-cream parlour, I tend to choose matcha flavour if they have it! Here are some of my favourite places for ice-cream! I feel that Tsujiri Tea House has extremely good ice-cream. It was so smooth, creeamy and has a really rich green tea flavour. I am impressed the soft and chewy mochi for the Shiratama Parfait and the green tea chiffon cake for the Chiffon Cake Parfait was a perfect combination with the soft serve ice-cream. However, I did not like the cornflakes in the middle of the parfait, thus I feel that mochis and red beans are more suitable for a green tea parfait. Being a matcha fan, I still frequent Tsujiri Tea House for some delightful and yummy green tea desserts! Another place for really good matcha ice-cream is a cafe named “Beans & Cream“. It is located in the neighbourhood at the West area and their staff are really friendly! The Kyoto-Uji matcha that they used to make their matcha green tea ice cream contains chlorella (绿藻), which has been touted as the perfect whole food that is highly nutritive to the body. A scoop of matcha icecream costs $3.50 and with such a big scoop, it is really worth it! Waffles with Green Tea and Cookies and Cream ice-cream ($9)! This is HEAVEN! Since I love matcha so much, I visited Isetan at Westgate and found this very yummy green tea ice cream! Their milk one is really good too, really love this brand of ice-cream! Lotte always has really good food products. especially their ice-cream! 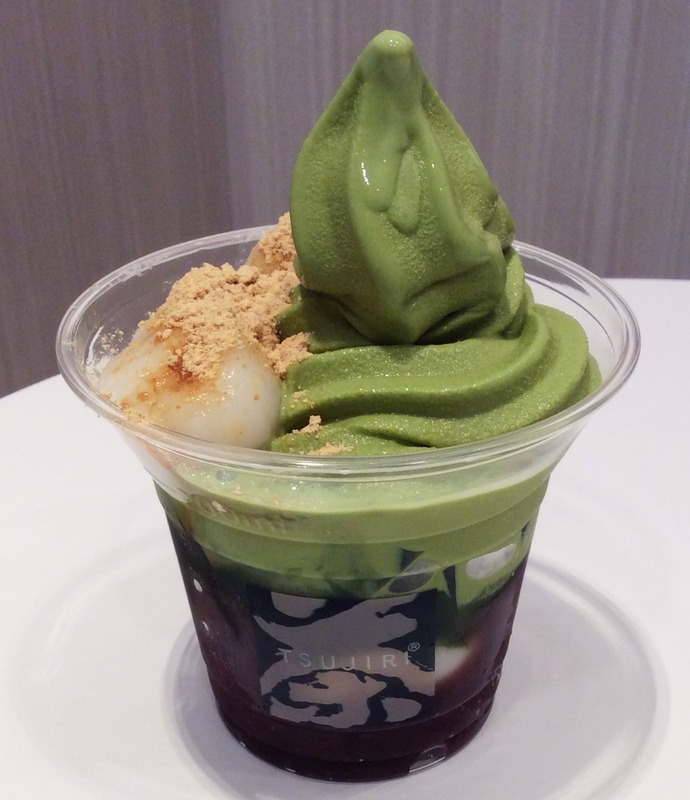 Azabu Sabo Hokkaido Ice Cream has good matcha ice cream too! I tried their green tea with azuki beans and normal green tea flavour, it was good but I still prefer Tsujiri Tea House for soft serve ice-cream. I had matcha gelato with waffles the other day at Gelato Cottage and I think it was average. Ice-cream size was smaller and price was slightly higher. Matcha ice-cream was rich but I find that their other flavours such as mocha. But I still love waffles and ice-cream. they make a great combination! Green Tea Shaved Ice from Ji De Chi is a MUST TRY!!! The red beans were sweet and the mochi balls were soft and chewy. However, I think the addition of Nata de Coco makes the whole dessert way too sweet, having the red beans and mochi balls should be just enough. To my surprise, the combination of all these ingredients still make it a very tasty dessert! With such a large portion, this price is definitely worth it! This dessert can be shared between two people, it is too much for just 1. This sweet and heavenly treat from Lady M uses fine green tea powder that is infused into every layer in it. Their Green tea Mille Crêpes cake is a sight to behold with no less than twenty lacy thin crêpes enveloping the lightest pastry cream, vibrant green tea flavors gently humming in the background. This well-loved dessert was a bliss to savour <3 It was fluffy and so delicious! This gorgeous fountain is at Lime at PARKROYAL on Pickering. When a matcha fan sees this, she goes crazy!!!! OMG, I am so in love with this beautiful fountain of wealth (Oops I mean green tea, but it was like gold sparkling in front of me! :p) This was definitely the highlight of the buffet when I went there for Valentine’s Day celebration this year and I was so happy to finally try it. It tasted so awesome!!! Took so many marshmallows just to dip and enjoy the yummy green tea chocolate! OMG! THIS IS HEAVEN!!! I tried green tea latte at Matt’s The Chocolate Shop and it was average. Guess they are more famous for their chocolate cakes. Mochi is Japanese rice cake made of mochigome, a short-grain japonica glutinous rice. I love mochis, they are sweet, soft and chewy. I think the Hot Matcha at Yellow Cup Coffee is awesome. Thank you so much Will! 🙂 Have a great week! You missed Nana’s Green Tea at PS. Go try! Where can i get those mochi? Matcha cream cake from Tampopo deli, Matcha soufflé from Miam Miam, Matcha cake from Antoinette.